The first time I had this Jamaican dish I fell in love. 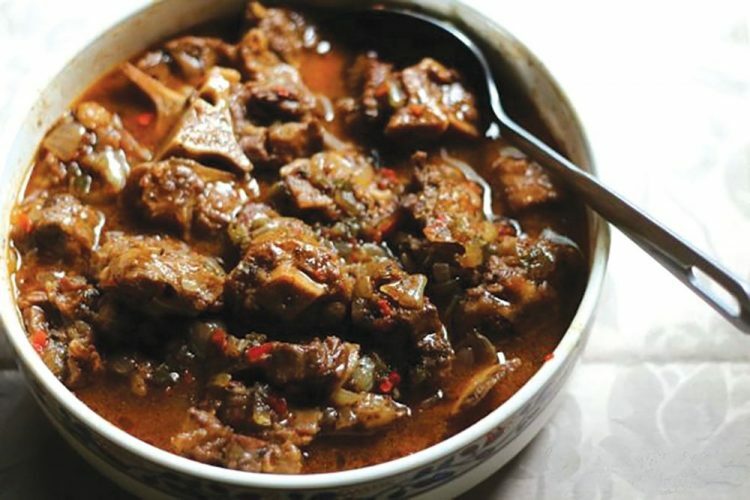 Oxtail stew (cow tail) is very similar to our beef stew and very delicious. Letâs not limit ourselves to just our local dishes; give this recipe a try and I guarantee you wonât be disappointed. This recipe can be used with beef, pork and even goat meat. Wash oxtails with water and lemon or vinegar. Season oxtails with salt, pepper, thyme, pimento, minced garlic, all-purpose seasoning, and browning/soy sauce/Worcester sauce and marinate overnight. Pour 2 tbsp cooking oil in a frying pan on high heat and add oxtail to the pan and brown throughout for 10-15 mins. Remove oxtails and put to the side. Add more oil to pot then add onions, garlic, chive, hot pepper (chopped), and sautÃ© for 5 mins. Then place the oxtails back into the pot, along with remaining marinade and add fresh thyme. Add 4 cups of water and stir well and cook oxtail for 2.5 hours, stirring every 30 mins (medium-high heat). Add corn flour/corn-starch to pot and mix well for thicker stew sauce. Add chopped tomatoes, carrots and mixed peppers and cook for 30 mins more and stir well. Simmer and add more water if necessary. At this stage, meat should be falling off bone and should be tender (if not cook for longer). Tip â Beans can be added; just add to the pot to simmer as well.